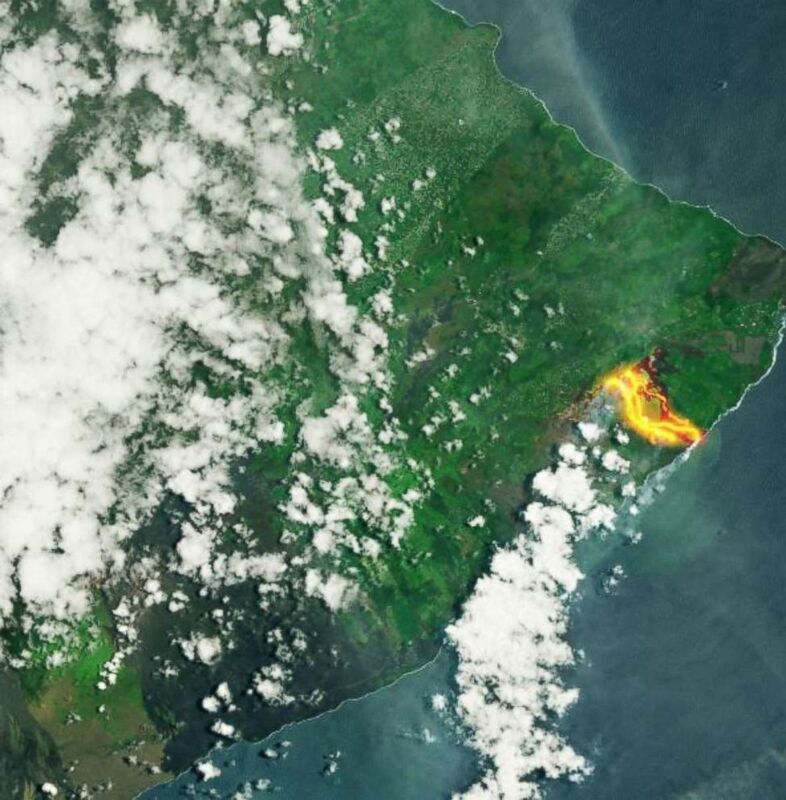 The spread of lava in the Puna district of Hawaii's Big Island has gotten so large it can be seen from space. The European Space Agency tweeted unbelievable photos of the lava that has gushed from over 20 fissures on the island since Kilauea erupted on May 3. Fissures No. 6, 13 and 22 have been the most active, flowing to the southeast into the ocean, according to the U.S. Geological Survey. The photos were taken on May 23 and shared by the ESA on Friday. There have been a total of 82 structures damaged from the lava so far, according to the Federal Emergency Management Agency (FEMA). Of those damaged, 41 are houses. 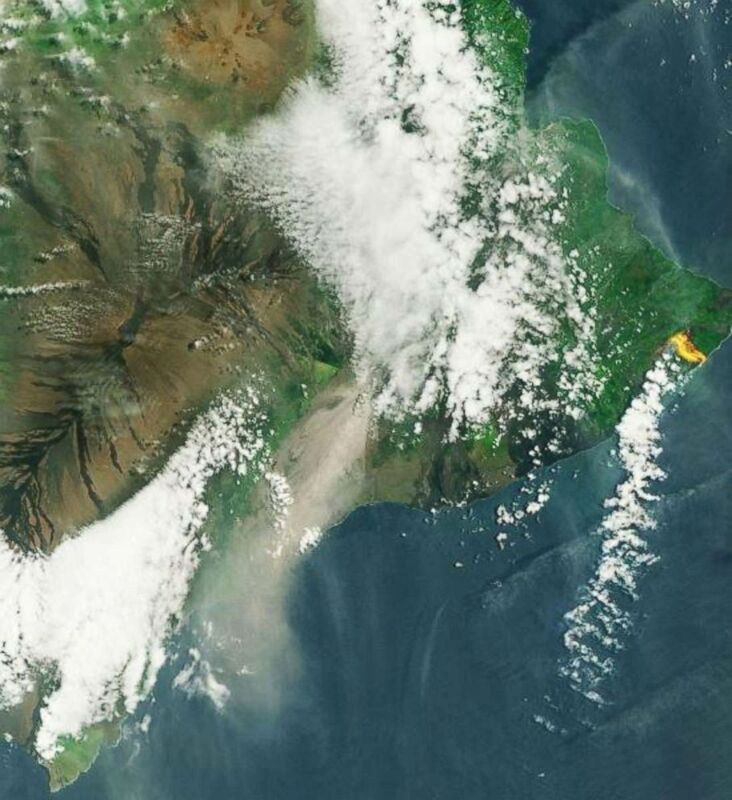 The fissures spewing lava in the eastern district of Puna on Hawaii's Big Island can be seen from space in this cropped photo taken May 23, 2018. The acreage covered by lava as of Friday night in Hawaii was 2,232 acres, officials said. The Civil Defense Agency also noted that 37 homes are "isolated" either due to lava surrounding them or roads being cut off by the flow. There’s still a potential for lava to cut off all access to the Lower Puna area, which would trigger the helicopter evacuations officials have been planning. The fissures spewing lava in the eastern district of Puna on Hawaii's Big Island can be seen from space in this photo taken May 23, 2018. As of Friday, there were 230 people in shelters, the agency said. ABC News' Frank Elaridi, Alyssa Pone and Clayton Sandell contributed to this report.